Mangaluru, Aug 30, 2016: Speaking at a meeting on the widening of NH 66 from Nanthoor to Talapady on Aug 29, Monday; Minister for Food and Civil Supplies U T Khader directed the NHAI, National Highway Authority of India officials to construct FOBs, foot overbridges on NH 66, for the benefit of common people. The minister also stressed to the officials to construct the bridges – conventionally provided at the beginning and end of flyovers – at Ekkur, Kallapu, Thokkottu, Kumpala Junction and Kotekar. The Minister said the four-laning of the road passing through Ekkur, Kallapu, Kumpala and Kotekar made it difficult for the pedestrians to cross the road. “When the flyover at Thokkottu is completed, the pedestrians will find it difficult to cross the road there too. There is a need to construct an FOB at the start of the flyover and also at the point where the flyover ends,” the Minister stressed. The Minister said that the NHAI should accelerate the work on flyovers at Pumpwell Circle and Thokkottu. “The service roads on the stretch from Talapady to Nanthoor should be completed at the earliest. At the same time, the authorities should install signage on the stretch to avoid accidents,” he suggested. 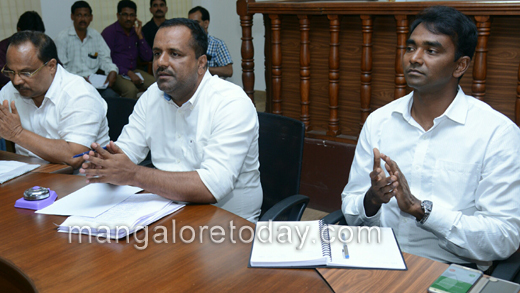 DK DC Dr K G Jagadeesha said that the structures or buildings on the stretch for which the compensation has already been paid should be cleared immediately to aid the construction of the service road beside the NH 66 from Talapady to Nanthoor. The officer also directed NHAI project director Samson Vijay Kumar to hand over the plan of service roads from Pumpwell Circle to Talapady to the concerned gram panchayats and local administrative bodies. The approach road to the national highway should also be widened, said DC Dr Jagadeesha. Talapady Gram Panchayat president Suresh Alva said that NHAI had cleared a building belonging to the Panchayat to facilitate the widening of the road. “The compensation, has not been paid to the Panchayat,” said the president. The project director, in response, said that the assistant commissioner’s recommendation for the payment of the compensation to the gram panchayat building would be considered. Minister Khader directed the NHAI officials to ensure that rainwater does not stagnate at the Thokkottu Junction. “Stormwater drains should be constructed for the easy flow of rainwater. Streetlights should be installed on the road from Talapady to Pumpwell Circle,” he also said. This road is very dangerous as from many years the work is under progress . So many accidents taking place as in some place t company in charge of the work doesn’t keep any reflectors or any sign boards to make known to the people.